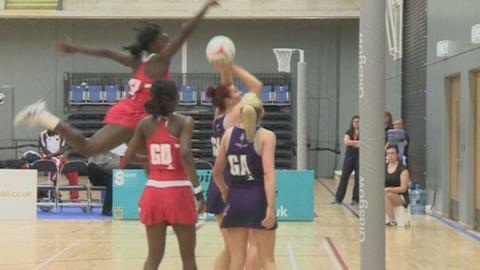 Can netball shake off its schoolgirl image? Scottish netball fans have plenty to celebrate. The Scottish Thistles are taking part in the Commonwealth games this year for the first time, and this weekend they hope to qualify for the 2015 World Cup. But while the Fifa World Cup, in a couple of weeks, might spark a flurry of football fans at local five-a-sides pitches, can netball's success on the elite stage have a similar impact at grassroots level? Most women in Scotland will have played netball at primary school at some point. Yet few keep playing recreationally. Now the sports governing body has announced that it will set up a campaign in an attempt to address this. Due to be launched in September, Bounce Back to Netball will be a "pay as you play" scheme for anyone who wants to give the sport a go. It will be piloted in Grampian before being rolled out across the country. Netball Scotland's plans were revealed during a meeting between Sports Secretary Shona Robison and Molly Rhone, president of the International Netball federation. But will it be a hard task persuading Scottish Thistles armchair fans to get down to a local court themselves? At a recent test match against Trinidad and Tobago, I asked women leaving the match whether they played. Excuses included work-life balance, fitness levels and age. Their position reflects a 2008 sportscotland study of Scottish Household Survey data, which showed only 3% of women who exercise play a team sport. It suggested that most women, who exercise at least once a month, choose swimming or keep fit classes instead. In comparison, about a fifth of men play team sports at least once a month - mostly five-a-side football. However, netball converts are passionate about the game - as I found out when I went to meet a group of women at The Dunblane Centre in Perthshire. Most are mums who met each other at the school gates. Karen Figliolini, 37, said: "In the past I tried lots of other sports like keep fit, aerobics and I really didn't enjoy it. I found it really boring. "So I came along about six years ago and I've been coming ever since." Ashley Shepherd, 41, said the social aspect was a big draw. "I mean we do play for the hour, but we also stop and have a chit chat in between," she said. "It's just good fun and sociable, and nobody takes it too seriously either." The main barrier for most had been to turn up for the first time. "I hadn't played sport for a long time, I was overweight and I was quite nervous about going along for the first time," said 42-year-old Lorna McIntosh. "But when I came along everybody was so friendly. They filled me in on the rules I didn't know, and I wasn't the most unfit, or the most fat or the smallest." Scotland's governing body's recent plan of attack has been to target schoolchildren. More than 400,000 pupils took part in netball sessions last year. Netball Scotland CEO Maggie Murray now hopes to emanate the success of the Back to Netball campaign in England for women over the age of 16, which has seen almost 2,000 new netball initiatives set up over the past four years. "In my generation almost every woman has played netball at some point in primary school," she said. "It's what have we done to lose that volume of people coming through. "So I think that's about resources, and trying to pull people together again - a call to arms." Sports Secretary Shona Robison welcomed the initiative, which she said would "allow women to turn up an play in the same way men can for five-a-sides, without having to commit to a big training schedule". "So women who are inspired by what they see at the Commonwealth Games can go back to netball or take it up for the first time," she added. Molly Rhone, president of the International Federation of Netball said England and Australia had both run successful recreational programmes. "It's not just about competing for your country, it's about keeping active. Netball is a fun game, a cheap game. It offers great camaraderie, and it offers something to do at the weekend or whenever." So perhaps then, we shouldn't consign our gym slips to the history books just yet. If you would like to try netball, go to our Get Inspired netball page. More information about the Bounce into Netball campaign will be posted by Netball Scotland in due course.